The Constellation program represents the first new American manned rocket since development of the space shuttle began in the early 1970s. As currently envisioned, the 33-story Ares 1 rocket will be made up of a five-segment solid-fuel shuttle booster and a new second stage powered by a hydrogen-fueled Apollo-era J-2X engine. The Orion capsule will sit atop the second stage, equipped with a solid-fuel abort rocket designed to pull a crew to safety at any point during the climb to space. The slender rocket, its second stage wider than the first, stands twice as tall as a space shuttle "stack." Its pencil-thin appearance quickly led to a somewhat derisive nickname: the "stick." NASA currently is modifying launch complex 39B at the Kennedy Space Center to support Ares 1 rockets. Three huge lightning rod towers are being built around the pad and the current fixed and rotating service structures in place for the space shuttle eventually will be removed. Pad 39A will be modified to support the Ares 5 heavy lift rocket after the shuttle is retired. Using a "clean pad" concept, the Ares 1 rocket will be hauled to the pad atop a modified shuttle launch platform equipped with its own support gantry. Engineers envision rolling the rocket to the pad about four days prior to launch for final preparations. The Ares 1 development program currently calls for four large-scale test flights: Ares 1-X in 2009; Ares 1-Y in 2012; and then two Ares/Orion test flights in 2013. If all goes well, the new rocket will be operational starting in late 2014 or shortly thereafter. For the first test flight - Ares 1-X - NASA will use a standard four-segment shuttle booster with an empty fifth segment and new 150-foot-diameter parachutes to lower the spent rocket to the ocean for recovery. A dummy second stage loaded with ballast and topped off with a make-believe Orion capsule and abort rocket will be bolted to the top of the first stage. Engineers are in the process of building the dummy second stage in the Vehicle Assembly Building, stacking "tuna can" segments and bolting them together from the inside. The second stage will be attached to the first stage motor after it is assembled, or "stacked," in the VAB next spring. The Ares 1-X first stage will be mounted on a modified shuttle launch platform, held in place by four explosive bolts just like shuttle boosters. Until just few hours before launch, the towering rocket will be stabilized by two swing arms mounted on the shuttle's fixed service structure. Of the $330 million budgeted for the Ares 1-X test flight, about $50 million is going to pay for facilities and processing modifications at the Kennedy Space Center. "A couple of years ago, when we all started looking at having a test flight, and a test flight program, we came up with a concept ... that would be minimal modifications to the existing facilities here, because we wanted to be low cost," Scott said. "You don't want to go do a lot of modifications for a one-time use. "These guys came up with a very clever concept for the upper stage, which has all the access for stacking and doing the work putting these tuna cans together, all the access is on the inside. So (when stacking is going on) his folks are going to be inside this vehicle and they're going to do it all from the inside." The test rocket is rigged with more than 800 sensors - 377 on the first stage and 446 on the second - to record an enormous amount of engineering data on all phases of flight, from launch through motor burn out two minutes later, through stage separation, parachute deployment and ocean impact. At least four video cameras will be mounted on the rocket, two on the first stage looking up and two on the second stage looking down. "The big issue with a big, tall, skinny rocket on the dynamics and the controllability of it, we're using existing hardware but it's a different environment," said Billy Stover, a ground systems manager for Ares 1-X. "There are a lot of unknowns. We have a lot of models, but we don't have a lot of data to verify the models. So we've got to go get some data, is it really going to go fly the way you think it is and the only way to do it is (fly it)." At launch, Ares 1-X will stand 327.2 feet tall and weigh 1.8 million pounds, generating some 2.6 million pounds of thrust. Unlike the space shuttle, which operates under fairly restrictive weather constraints, the Ares system is being designed to launch in less-than-ideal weather. One area of concern is worst-case winds from the south, which could push the rocket close to its launch gantry as it climbs away. Decades of weather records indicate worst-case conditions would only be expected less than 1 percent of the time and in any case, engineers say the rocket's guidance system can easily steer the vehicle away from any close encounters with its gantry. Alternatively, NASA could simply impose shuttle wind constraints and not launch on days when worst-case winds are expected. For Ares 1-X, a modified Atlas countdown will be used, along with Atlas-heritage avionics software and hardware. Because it's a maiden voyage of sorts, NASA managers have decided launch will only occur when there is not a space shuttle on nearby pad 39A. One wild card in NASA's planning is what to do about shuttle flight STS-125, a delayed mission to service and upgrade the Hubble Space Telescope. Launch from pad 39A currently is targeted for May 12. Because the Hubble crew cannot reach safe haven aboard the international space station in case of an emergency, NASA will process a second shuttle in parallel to serve as a rescue vehicle. For the Hubble crew's first launch campaign earlier this Fall, the rescue shuttle was processed on pad 39B. Agency planners are considering a plan that would free up pad 39B for Ares 1-X by processing the rescue shuttle in the Vehicle Assembly Building. If single-pad processing is approved for the Hubble mission, Ares 1-X could fly as early as July 11 or 12, although engineers say the timeline is tight. If the agency sticks with dual-pad operations for Hubble, launch would slip to next Fall. As of this writing, it appears more likely NASA will stick with dual-pad operations because of problems with payload bay door moisture-absorption that might occur if the rescue shuttle is kept inside the Vehicle Assembly Building for an extended period. Mission managers plan to make a decision one way or the other after a Jan. 23 meeting to review shuttle processing options and Ares 1-X hardware deliveries. While the Constellation program would like to get the flight off as soon as possible, a launch anytime next year would still let the team meet its goal of collecting flight data from Ares 1-X well ahead of the Ares 1 critical design review in early 2010. Whenever it goes, the rocket should put on quite a show. Accelerating to a peak velocity of nearly five times the speed of sound, the first stage will burn for about two minutes, reaching an altitude of around 130,000 feet, or 25 miles. When the rocket's thrust falls to less than 40,000 pounds of push, the first and second stages will separate. The ballistic trajectory will carry the dummy second stage to a maximum altitude of about 150,000 feet before it begins arcing over and plunges back to Earth. 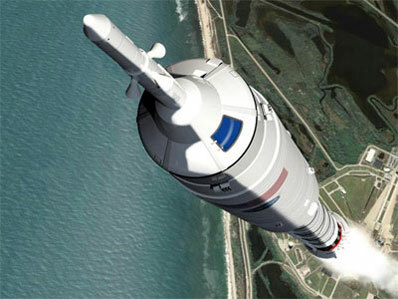 The first stage will make a controlled descent to the Atlantic Ocean under three huge parachutes. The spent booster will be towed back to Cape Canaveral for detailed inspections, but there are no plans to recover the dummy upper stage. Among the areas of special interest are thrust oscillations, roll control, stage separation and the performance of the new parachutes, designed to help slow and stabilize the larger five-segment booster when it falls back to Earth from a higher altitude. For roll control, Ares 1-X will be equipped with two thrusters on each side of the rocket near the base of second stage. To keep costs down, the system was borrowed from the Peacekeeper ICBM program. "There's a flow circulation as the flow comes out through the nozzle," said Charles Precourt, a former shuttle commander who serves as vice president of space launch systems for ATK, builder of the shuttle/Ares solid-fuel boosters. "I'm going to use a real crude analogy, but when water goes down the drain you know how it circulates? Well, in a similar fashion, you get a torque force generated by the flow coming out the motor. We understand what it is, we've measured it and we've sized that for this roll control system on 1-X." The magnitude of the roll force varies a bit from rocket to rocket, but it begins with motor ignition and continues through burnout. "There's a torque that will vary a little bit in magnitude, but it is essentially there during the flow of the exhaust out through the nozzle," Precourt said. "The roll control system will have to pulse to counter that. We understand, to the degree the analysis allows, we've been able to understand how much will be required, but this will be validation of that. It's not going to be spinning the vehicle at a high rate, it's just going to cause it to want to turn. And so we're going to control how much it turns." Like the space shuttle, Ares 1-X will execute a "roll program" to put it in the proper orientation as it arcs to the East and climbs toward space. The roll torque phenomenon can either help or hinder the roll program. "Let's say it causes you to roll in the direction you want to go in, then you may need less of a pulse from your RCS (reaction control system thrusters) to get the roll you have asked for," Precourt said. "If it's against you, you may need more of a pulse to go the other way." Data collected during the Ares 1-X flight will help engineers better understand the roll torque phenomenon and design a suitable roll control system for the Ares 1 rocket. Another major question mark is thrust oscillation and vibration, the result of vortices forming inside the booster as part of the complex supersonic exhaust flow. Engineers are designing dampers to "de-tune" the first stage booster and the upper stage/Orion components to minimize amplification effects that might otherwise occur toward the end of the first stage burn. No such dampers will be in place on the Ares 1-X rocket. Instead, sensors will characterize the thrust oscillation present in a four-segment motor to help engineers properly model the sort of acoustic environment present in a five-segment booster. "This is a four segment motor, but it's got a fifth segment simulator and the mass and size of the vehicle is representative," Precourt said. "So the data will be instructive. We really won't have real flight data of what the crew will ride, for vibration purposes, until Ares 1-Y. That'll be the first time we see everything that is essentially identical to what the crew will see. (But) we will collect a great amount of data to help us further understand what we're dealing with." Solid-fuel rocket motors are hollow and, like a bottle rocket, burn from the inside out. Moving from a four-segment booster to one with five segments changes the frequency of the vibrations produced by the burning propellant. "If you've got a longer pipe, the frequency drops, just like when you whistle over a Coke bottle, the more full it is the higher the pitch and the more empty it is, the lower the pitch," Precourt said. "Well, that's what's happening here. As the motor gets longer, the frequency changes and when the frequency changes relative to what we've had in the past, we just need to understand where it ends up relative to the natural resonance of the structure that's sitting on top of it. We want to separate the resonance frequency of the structure on top as far as we can from the frequency this motor is creating." The problem is not just the vibrations of the first stage motor. It's how those vibrations are amplified by the rest of the structure, much like a tuning fork sounds louder when its base is pressed to a solid surface. "The motor as it burns hasn't got a continuous amount of vibration," Precourt said. "This oscillation that we get is a little more random in that it comes and goes. Part of that is due to the fact that as we burn the propellant off, the flow is causing some vortices to form as it's coming out of the motor and those vortices will attach and unattach inside, it's all this complex flow inside, it's not a turning piece of hardware machinery, it's propellant burning and coming out the back at a very high rate. But it's got some random oscillations in it that tend to be the most noticeable from a thrust oscillation standpoint in the last few seconds of the motor's burn." Precourt said the sort of up-and-down jarring shuttle crews experience at launch illustrates the sort of forces that get transmitted through the vehicle from the boosters and "we certainly wouldn't want it to get a lot worse than that." "When the frequency of the motor changes and you happen to build a structure that's sitting on top of it that is at that same resonant frequency, in other words, its size and shape and mass and stiffness all say that if it is introduced to the same frequency as the motor, it will resonate and it will amplify that frequency," he said. "In the case of the shuttle, it doesn't do much amplification because the structures aren't that close to the frequency of the motor. But in the case of Ares 1, there's a potential that when you add the crew vehicle on top, the upper stage and our motor, the frequencies could be close enough that you get more amplification. And that amplification is an upward and downward movement of the structure that can be translated into a G force. And if that G force gets too high, then of course, the crew is in a bad environment. So that's what we're trying to do, to make sure that G level stays down to about a quarter of one G."
Based on data collected during launch of the shuttle Endeavour in November, engineers no longer think they will need to add active dampers to move the frequencies away from each other or dampen the amplitude of the effect. Instead, passive spring-mounted weights are envisioned to counteract the effects of thrust oscillation. Additional data will be collected during upcoming shuttle flights. "There's also a structural thing we can do just above our motor that is a what we call a C-clamp isolator," Precourt said. "That will tend to move the frequencies of the structure above and the motor below apart, away from each other a little bit. So we're looking at all of those things. The latest data suggest that the amount of amplification we're going to get may not be as severe as we initially were looking at. So we'll just continue to work it. It's well within our ability to mitigate so we hit the target structural result." The coupling of vibration frequencies is not linear and a slight separation in frequencies will result in a significant reduction in vibration. Precourt said engineers won't know exactly how the resonance phenomenon works until NASA launches Ares 1-Y with a five-segment motor. But the Ares 1-X flight will pave the way to better modeling. "What you won't have on this, obviously, is the fifth segment and the upper stage J-2," he said. "Rather than waiting and doing it all at once, we've taken an incremental approach that retires risks that can be retired as quickly as possible. "We don't need to do any of this if you want to take the approach that the outsiders are suggesting, just wait until the very end, build it all at once and go fly it. But (that approach ignores) the mantra and principle of many, many years of flight test, both in rockets and in other flight vehicles and aircraft, that you do a build-up approach and you depart from a known and you move towards an unknown in incremental fashion. And this is a really good first incremental test." Hanley agreed, saying he sees two primary benefits for the Constellation program. "The first, of course, is the engineering value we'll get out of it," he said. "We've had issues like thrust oscillation that have come up over the last year, which is the kind of thing we can be interrogating with real hardware under real flight conditions. That kind of data is like gold to engineers. We test to be able to better improve our understanding of the flight hardware behavior and the way that we model. ... The computer models are only as good as the real life data you have to base them on. And so Ares 1-X, we expect it to be a dynamically similar system to Ares 1. "The other half of it is really being a pathfinder to help us both train our team and understand and appreciate what it takes to process a system like this at this scale, using new, more modern techniques and systems. We started with the way shuttle does business. But we are going to, to a great extent, lean that out. Because what we want to do is end up with a system that is as low cost and efficient as we've ever achieved in human spaceflight."